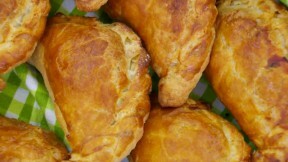 Richard's minted lamb pasties recipe is featured in the "Pastries" episode of The Great British Baking Show. For the rough puff pastry, put the butter and lard in a bowl and briefly mix. Put the flour and salt in a large mixing bowl and, using your fingertips, briefly rub about a quarter of the butter and lard mixture into the flour (you should still see lumps of butter). Add 50ml (2¾ fl oz) cold water and the lemon juice and mix until it comes together to form a dough. Roughly shape the dough into a rectangle. On a lightly floured work surface, roll out the dough into a rectangle about the thickness of a pound coin. With a short end of the rectangle facing you, scatter the remaining lard and butter over the top two thirds of the dough. Fold the bottom third over the butter, then fold the top third down. Rotate the dough 90 degrees, then roll out the dough into a rectangle as before and repeat the folding. Turn, roll and fold the dough another two times, then wrap in cling film and refrigerate for 20 minutes. For the mint sauce, sprinkle the mint leaves with a little salt and finely chop. Transfer to a jug and pour over about 100ml (3½ fl oz) boiling water. Add the sugar, stir well and leave to cool. When cooled, stir in the white wine vinegar. For the rough puff pastry, take the cooled pastry from the fridge and repeat the rolling and folding one more time, then return it to the fridge for another 20 minutes. For the filling, in a medium bowl combine the lamb, garlic and dried rosemary. Add half of the mint sauce and season with salt and pepper. Cover with cling film and set aside. Add the onion, sweet potato, carrots, parsley and oregano to a separate bowl. Add the rest of the mint sauce, season with salt and pepper and mix well. Finally add the frozen peas and mix again. Preheat the oven to 180C/350F/Gas 4 and line two large baking trays with baking parchment. Roll out the pastry to about 3mm thickness. Cut out 6 circles, approximately 13cm (5 in) in diameter using a small saucer or bowl as a guide. Any offcuts can be rolled out again to make more circles. Put a few spoonfuls of the vegetable filling to one side of each circle and top with a few pieces of lamb – you need enough to fill the pastry but not so full that the pastry will split open. Fold the pastry over the filling (to encase the filling) and use a little water to help the edges of the pastry stick. Crimp the edges using your fingers and place on a baking tray. Repeat until each baking sheet has six pasties on them. Brush each pasty with beaten egg and bake for about 40 minutes, or until golden-brown. When cooked, use a fish slice to lift the pasties onto wire racks to cool before serving.